You might want to set up a telephone pole around your place for a variety of reason. You may need a utility pole to run power to your workshop or barn. You may need something to mount a ham radio antenna, a satellite dish or a even a flag pole. A flag pole can be heavy and dangerous to install. For most home or private use, a second-hand telephone pole is quite adequate. If there is to be pressure or a heavy wire load on the pole, you'll want to buy a new pole. The height of the pole is going to depend on the application you have in mind. Utility company standards call for 1/6th of the pole to be buried. If the pole is set on a slope, you should add the diameter of the base of the post to the amount to be buried underground. Other authorities recommend burying up to a third of the pole underground, but for private use this is probably overkill. Another formula for a freestanding pole is 10 percent of the length plus 1 foot. This is probably the minimum hole depth. Poles come treated with creosote in most cases. In 2003, the industry stopped treating with CCA (chromated copper arsenate) and fell back on creosote. 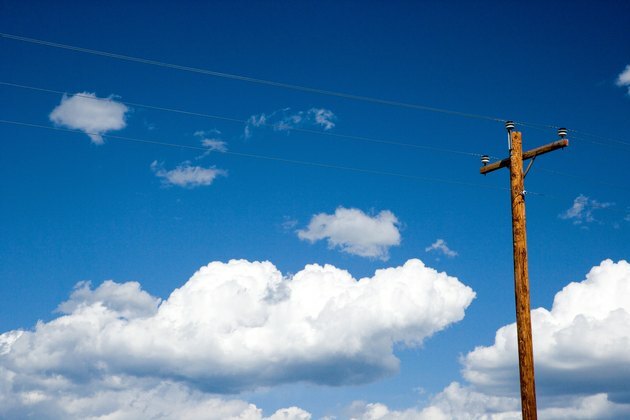 While no particular precautions are advised for treating older CCA treated poles, leather gloves and long sleeves should be worn when handling treated telephone poles. Once you've determined the height you want the pole to be above ground, make sure that the hole is 1/6th as deep as the total above ground length. Make the hole wide enough for a pair of 2x4s to fit along one side of the hole while allowing the pole to slide down into the hole. About a foot wider than the pole should be adequate. If you don't have a crane or backhoe to lift the pole and set it down into the hole, you'll need a winch or come-along. Place a pair of 2x4s down along one side of the hole to brace the bottom of the pole. They should stick up out of the hole higher than the width of pole at the base. Dig a shallow trench away from the pole in the direction the pole will lie as you pull it upright. The pole should lie in the trench, slide into the hole and brace against the pair of 2x4s as you pull it upright. Attach the winch high on the pole and, as high as you can attach it to a nearby tree or other structure. Attach a pair of ropes high on the pole to stabilize it as it comes up. Get a couple of helpers to hold them to keep the pole from swaying as you winch the top up. As the top of the pole is winched up, the base will begin to slide down into the pole along the 2x4 guides. When it gets high enough the pole will slip down into the hole., Remove the 2x4 guides and tie the pole vertical with the winch and guide ropes. Use surrounding earth and natural materials and tamp it down firmly into the hole. Concrete is not recommended and may lead to the base rotting. Backfill the hole 1 foot at a time to 90 percent of its original compaction. Once the backfill is compacted, remove the winch and guide ropes and let the pole set for several days. Go back and tamp the soil in the hole one more time and backfill as needed. What Is the Average Mantle Height?